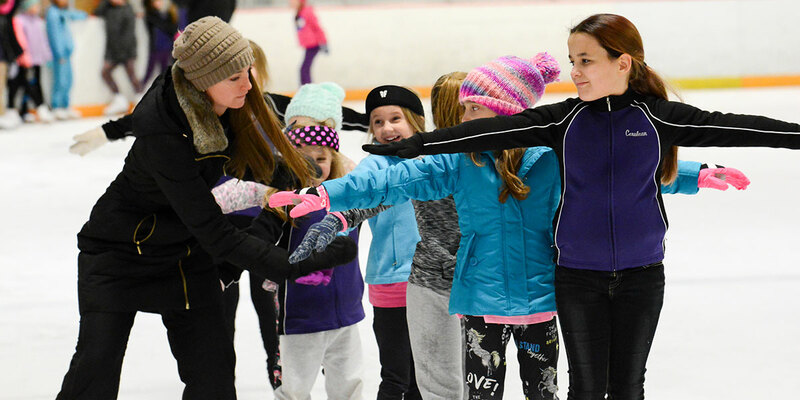 A typical class includes five skaters with one coach per class, a helper is added to any larger classes, with a maximum of 10 skaters per class. We have walkers for the beginner skaters and multi level classes, ranging from beginner to advanced. Skaters are required to have their own skates, available online or at your local sporting good store, a hockey or bicycle helmet and gloves. Make-ups are allowed for missed classes. Class skaters from Niagara University and Hockey Outlet receive a discounted price of $3 to practice during a 50 minute public session held on Fridays at 7:35pm. and Sundays at 6:30pm. at Niagara University Ice Complex. Our semi-private lessons consist of one coach and two students for a 15-minute lesson. The lessons take place during a 30-minute figure skating session. Therefore, the students can practice for 15 minutes on what they have learned. Younger skaters that are unable to practice by themselves are invited to join a class for free during the practice time. Our private lessons consist of one coach to one student. All private lessons are tested through the United States Learn to Skate program basic skills program and we have a progress chart at Niagara University with all of the names and pictures of the private lesson skaters. If you are interested in private lessons, please contact for a more detailed explanation. Skaters have the opportunity to join the Niagara University Skating Club, membership includes a competitive travel team, provides United States Figure Skating test sessions, a holiday show and various parties throughout the year for it’s members. For those students interested in playing hockey, both rinks have in-house youth hockey leagues. We strive to prepare our students with sound skating abilities before venturing into competitive hockey. There is no skate rental available, as you can buy inexpensive skates online or at your local sporting goods store.